Singer, songwriter Katrina “Kat” Williams and her trio will entertain guests at the Day of the African Equestrian soirée on Saturday Evening, September 22nd at Harambee Farm in the Green Creek Township of North Carolina’s Polk County. The evening will benefit Africa focused charities. Rutherfordton, NC, September 21, 2018 — Singer, songwriter Katrina “Kat” Williams and her trio will entertain guests at the Day of the African Equestrian soirée on Saturday Evening, September 22nd at Harambee Farm in the Green Creek Township of North Carolina’s Polk County. The location is proximate to the Tryon International Equestrian Center (TIEC) – site of the 2018 FEI World Equestrian Games. “The best party of the 2018 World Equestrian Games…” will celebrate the participation of African athletes, coaches, horses and supporters in the 2018 Fédération Equestre Internationale (FEI) World Equestrian Games (WEG). Originally scheduled for Sunday, September 16th, the celebration was postponed due to safety concerns raised by Hurricane Florence. The gala honors contributions to equestrian knowledge, history, sport and tradition made by residents of African nations – as well as by persons of African heritage living in Europe, Asia, the Americas and throughout the world. A finalist on the popular NBC-TV talent competition program America’s Got Talent, Katrina Williams received a 2012 Emmy Award nomination for her work on the Hands of Hope project. That same year, she received the Artists Music Guild (AMG) Heritage Award for Female Vocalist of the Year. 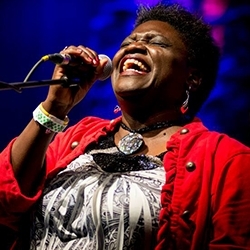 During her performance at Harambee Farm, Ms. Williams will be accompanied by Richard Shulman on piano, Shannon Hoover on upright bass and Justin Watt on drums. The event will be catered by the renowned Hare and Hound Pub of Landrum, SC. Among the guests honored via the Day of the African Equestrian celebration will be a delegation representing the African Confederation of Equestrian Sports (ACES) – one of five continental associations recognized by the Fédération Equestre Internationale (FEI). National Federations governing equestrian sport in twenty (20) African nations are currently members of the FEI and ACES. Tickets are priced between $20.00 and $30.00 per person for the cocktail reception. The event is produced by SportsQuest International, LLC and will benefit Africa focused charitable and educational institutions including Africare and the Focus on Africa (FOA) program at Merrill College – one of ten residential colleges at the University of California, Santa Cruz (UCSC). Funds raised for Merrill College during the FEI World Equestrian Games will support students requiring financial assistance for travel to and from Africa during the 2018/2019 academic year. The FEI World Equestrian GamesTM are the major international championships for equestrian sport, and are administered by the Fédération Equestre Internationale (FEI). Featuring world championships in eight (8) equestrian disciplines – Jumping, Dressage and Para-Equestrian Dressage, Eventing, Driving, Endurance, Vaulting and Reining – the games have been held every four years (in the middle of the Olympic cycle) since 1990. Brown Paper Tickets, the Not-Just-for-Profit ticketing company, has disrupted the ticketing industry for over a decade, offering socially-conscious event ticketing and management tools that include “pay it forward” donations made to social causes with every purchase, producer payment policies, community engagement programs and free services, designed to “give more.” The world’s first free online event registration and ticketing company, the Seattle, Washington (USA) based service has been used by 10 million+ ticket buyers in 27 countries since its founding in 2000. Please Note: Targeted activities and an evening of musical entertainment scheduled for Monday, September 17th in the Town of Tryon were canceled due to the hurricane.